Auction or scrap your car for charity! Life with cancer is still life. We'll help you live it. Transforming young lives through mentoring. Start fundraising with Giveacar today. Dedicated to the fight against childhood cancer. Tell us about your unwanted car or motorbike. We'll arrange to collect it for free. Depending on its condition, your vehicle will either be auctioned or scrapped. We'll donate the proceeds to your chosen charity and send you a receipt. Get rid of your unwanted car. Fast, free and for charity. Giveacar is a not-for-profit social enterprise that can turn your old car into cash for any UK charity. We arrange free collection, then either sell your car at auction or scrap it with the proceeds (minus our service fees) raised going to your charity. 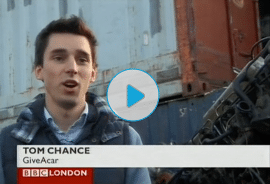 The UK’s first car donation scheme, Giveacar has won several awards, has over 1,600 charities registered with us and has supported thousands more with the money raised from old cars. Using a nationwide network of breakers yards and salvage partners, we have handled the auction and disposal of over 35,000 vehicles so we know how to raise the best donation possible whether your car is in perfect condition or not. If you need to get rid of an old car and would like to do some good at the same time, give us a call! We had an old car. Junkyards weren't interested: wanted paying to take it away. Contacted Giveacar and they had it removed quickly and efficiently and donated £100 to a local hospice. What more can you ask? An excellent pain free way of disposing of one’s old car in a constructive, socially beneficially manner. The least painful way to say goodbye to a car! An efficient, well explained process. Collector was very likeable, which made it easier to part with a car which had been part of the family for eleven years. Thank you Giveacar! You've helped us raise over £2.5m for 1,600 charities. For charity. Not for profit. We’re proud to be a social enterprise. We have no shareholders to reward, we’re not affiliated to any corporate salvage business and we don’t make a profit from your car donation. Instead, we aim to take the time to maximise the value of your vehicle. So after years of faithful service to you, your car will fetch the most it can so it can do the most good.